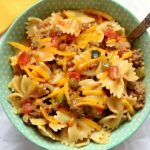 All the amazing flavors from cheeseburgers in a one pot pasta dish. Your whole family will love this dinner! Turn your Instant Pot to the saute setting. When the display says HOT add in the ground beef and brown it for about 5 minutes. Add in the diced onion and saute the onion in the grease from the beef for about 3 minutes. If there is excess grease, you can drain it off or spoon it out. Add in the water and deglaze the pot, if it needs it. Add in the pasta, diced tomatoes, pickles, mustard, ketchup, steak seasoning and seasoned salt. Stir a bit. Cover the pot and secure the lid. Make sure valve is set to “sealing.” Set the manual/pressure cook button to 4 minutes. When the time is up you can perform a quick release by moving the valve to venting. If any foam comes out of the valve just move it back to sealing. Try again in 20 seconds to move it to venting. Remove the lid and stir. Add in the cheese and stir until it is melted.